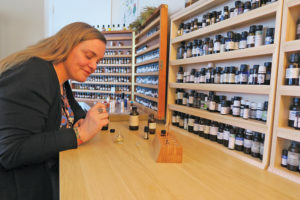 When Kendall Wishnick Adams recalls what brought her to opening her own perfumery and aromatherapy business in Sandpoint, she is first drawn to say attending natural perfumery school inspired her. Kendall Adams working in her Sandpoint perfumery. Photo by Lyndsie Kiebert. But no, the real inspiration came when she went to nursery professional school. Well, maybe it was before that, when she worked at All Seasons Garden & Floral for 10 years. Finally, Adams has to admit she is ultimately inspired to share her passion for fragrances with people because of a very simple fact: She is, and has always been, a plant person. She didn’t get to fully realize her passion until she moved to California for college and had a yard — something the New York City native had never experienced. Now Adams has been distilling her own home-grown plants on 12 acres in north Sandpoint for about five years. Distilling is the practice of heating up plant matter and extracting essences to create beneficial substances from specific plants. Adams specializes in hydrosols, which are water-based extractions from fresh plant material. Hydrosols are light, whereas essential oils are the more concentrated extractions requiring larger amounts of dry plant material. Adams said the practice of distillation brought together her interests in plants and the effects of scent. “When I found this, it was so awesome — it was such a bridge between everything I loved,” she said. Now, Adams is sharing her experience in distillation and aromatherapy to create custom perfume blends and other plant-based products through her business Crafted Botanicals, established in 2014. “I’m trying to (give) people an experience through aroma, and I’m educating them at the same time on how these aromas got from the ground into the bottle,” she said about her personal consultation sessions. Adams said the formula to create a perfume includes three elements: a base, middle and top note. One five-star review on the Crafted Botanicals Facebook page highlights just how personal the process is. 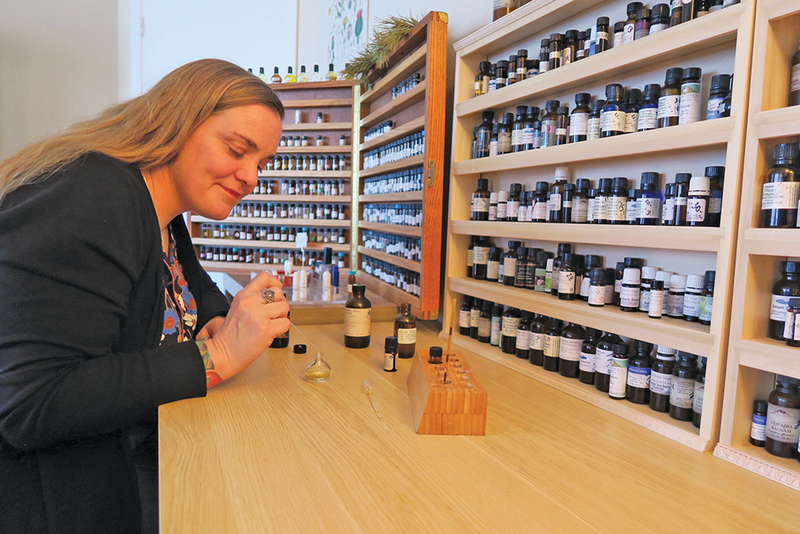 The emotional power of scent is part of what keeps Adams interested in her work. Adams said aromatherapy and other plant-based products — like a salve she’s made to treat eczema — can help treat conditions like anxiety, digestion issues, insomnia or even grief. As a small-scale farmer, Adams said she wants anyone interested in essential oils to be sure the products they buy are made from ethically harvested plants. One way to make sure distillers are legitimate is to check out Gas Chromatography Mass Spectrometry (GC-MS) reports to be sure they are different for each batch of oils. No two GC-MS reports will ever be the same, Adams said, because every distillation is different based on what soil the plant grew in, what it grew next to, during which season it was harvested and a number of other factors. As Adams delves deeper into her passion for plants, she’s sure to make helping people part of her overall mission. “If I can help someone emotionally or even physically with something I’ve made, then at the end of the day I feel good,” she said. Contact Adams at (208) 610-1063 or [email protected] to set up an appointment at her Sandpoint perfumery. Learn more about Crafted Botanicals at www.craftedbotanicals.com or on Facebook.